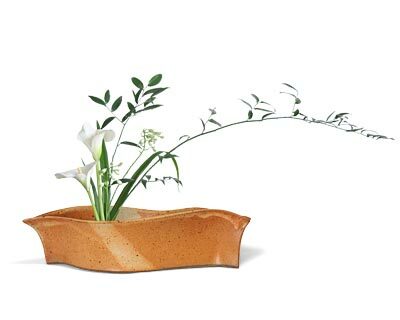 Outdoor Living > Plants & Lawn Care > Pots & Planters > Pots & Planters, Small, <13"
Place a dramatic plant arrangement on your table using this Anthony Stoneware Butternut Contemporary Ikebana. A traditional Japanese style of floral arrangement, Ikebana celebrates the geometry of nature and showcases that with minimalist groupings and low, sleek containers. This fantastic, ceramic vessel is sure to further the theme, thanks to its oval shape, neutral finish, and low profile. The sides of this container flare outward in the center and taper at each end, while the slightly uneven top rim evokes waves. Orange, tan, and brown glazes throughout this piece perfectly offset the greenery of any arrangements, and the generous, flat base rests on a level surface indoors or out. Floral frog pins sit in this vessel, perfect for holding your leaves or blooms. The hardy construction of this container will become a favorite piece for many seasons, remaining beautiful in virtually any setting. Create a striking centerpiece for your next gathering and display it in this Butternut Contemporary Ikebana. Made in the USA.